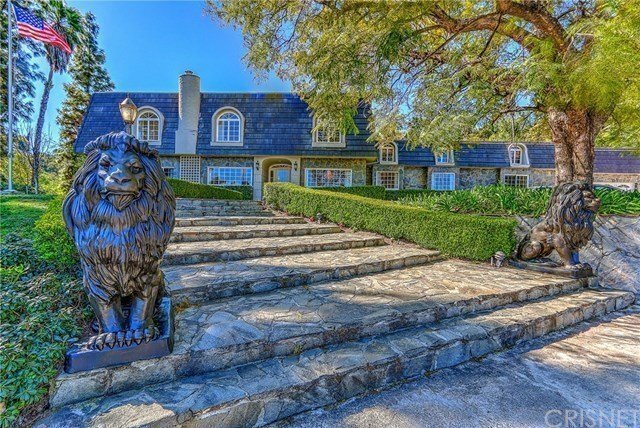 This wonderful gated 1+ acre Encino estate is ready for market. This French/colonial home offers amazing park-like grounds w/circular driveway offering plenty of parking, and mermaid like fountain filled w/koi fish. Grand stone walkway leads to the gleaming marble entry hall w/high ceilings and 9ft doors. Wonderful views throughout, plenty of windows and french doors, plus lots of built-in shelving and entertainment center. Plus maids quarters and additional powder room. Kitchen w/plenty of counter space, center island w/cooktop and sink, breakfast room w/custom windows. Wood paneled walls in the game room w/wet bar and wine cellar closet and fireplace. Music room or bedroom w/sound proof walls. French panel doors that lead to the shady grass area outside. 3 bedroom suites downstairs! 2 master suites upstairs! Main master w/northward valley views, fireplace and large bath w/Spa jetted step down tub w/large oval window that splits the his and hers baths. Walk in closet! 2nd master w/northward and westward views, fireplace, large oval spa tub, sep shower stall and split single sinks vanities. His and hers walk in closets. 1 additional bedroom upstairs w/west views. Backyard w/2 koi ponds in a tropical setting theme that gives you a feeling of being in a private resort. Large grass area perfect for entertaining! Last but not least, pool and spa w/waterfalls and pour-overs. Oversized 3 car garage w/upper storage. 3 A/C cooling units. A variety of fruit trees to pick from too!